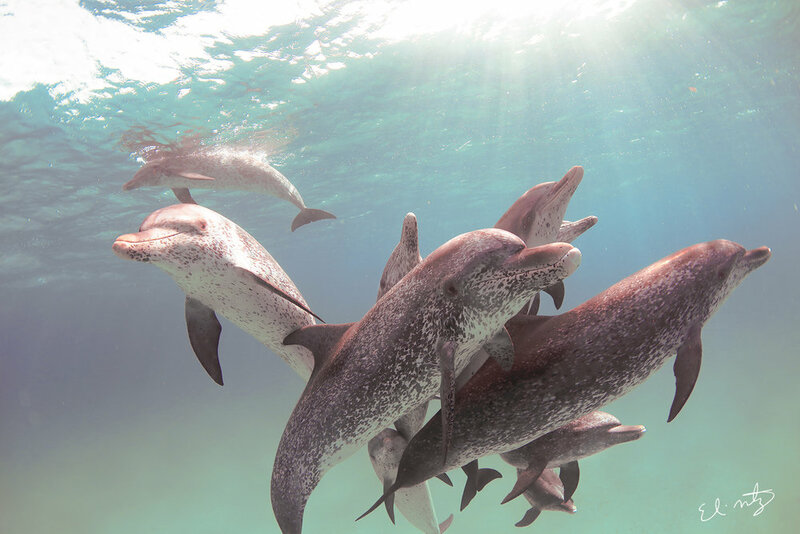 We are seeking out encounters with friendly Atlantic spotted and bottlenose dolphins off Bimini Island, Bahamas. 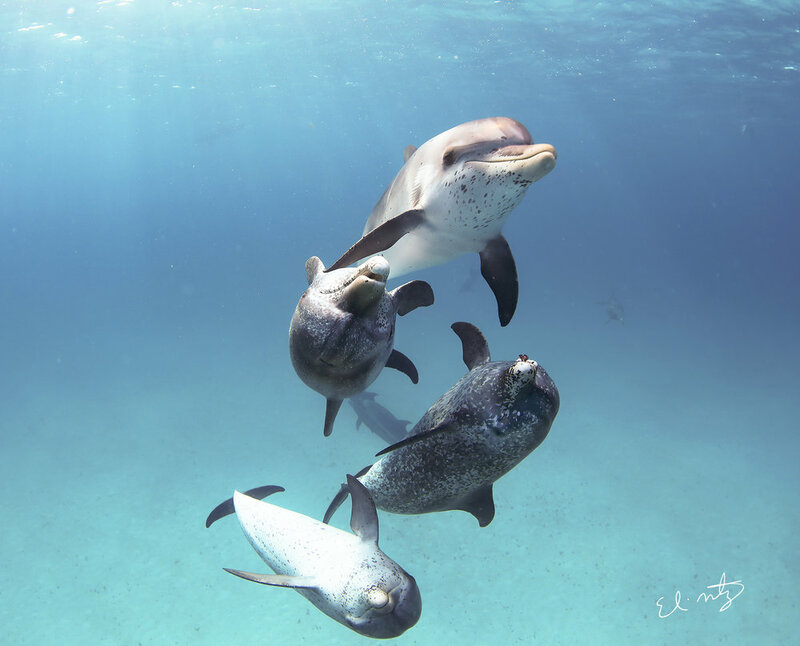 Bimini is famous, not only for their great hammerheads and reef sharks, but also for their VERY friendly spotted dolphins. 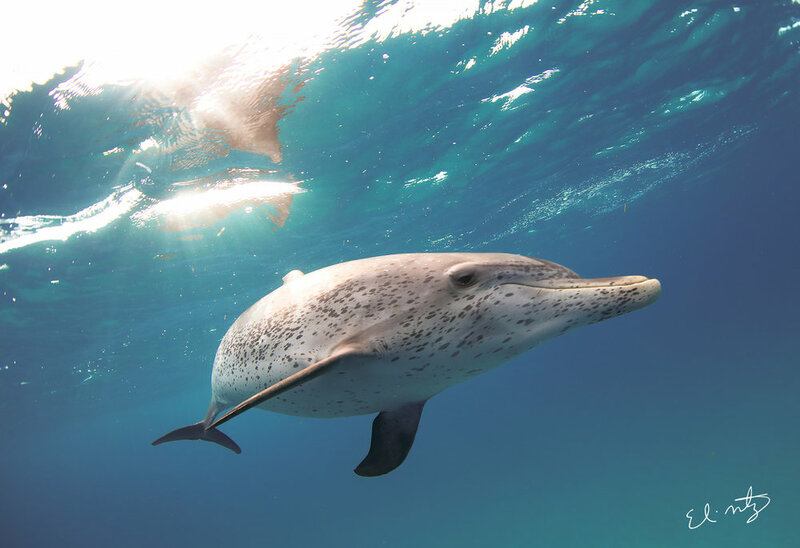 We will spend three days swimming with Atlantic spotted dolphins and hopefully bottlenose dolphins, which occasionally hang around the dolphin grounds, which is the area we visit when seeking out dolphins. This adventure is open to all experience levels and is a great adventure for the whole family. 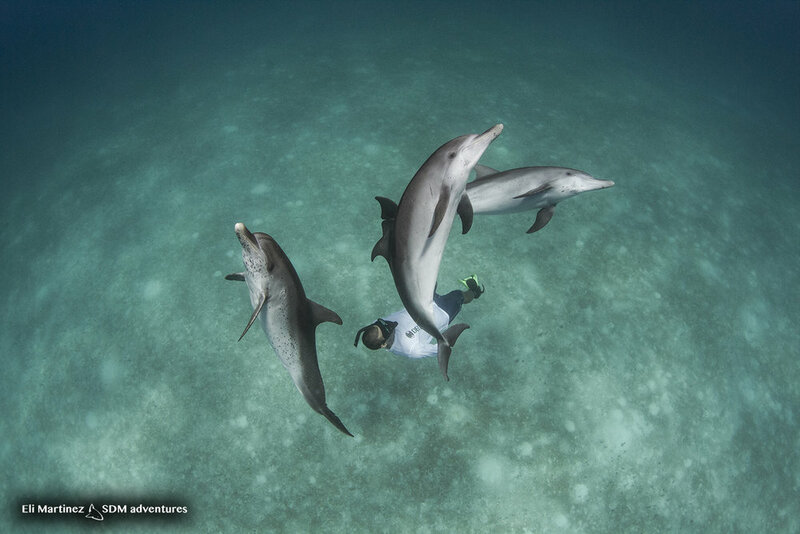 Please Note; These are wild dolphin encounters and everyday is different. Some days, the dolphins may be hard to find and not very social. 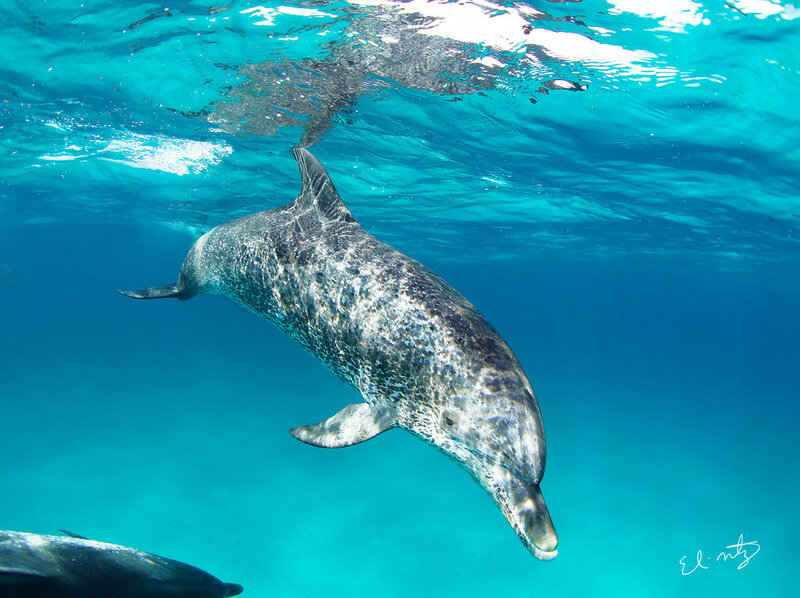 However, the pod that spends their time here off Bimini are extremely social and often choose to interact with snorkelers and have been known to stay with us for hours. Day 1 - Arrival day. You fly into Bimini airport (South Bimini), from there you take a taxi to the ferry, take the ferry to North Bimini, to our hotel (on the marina). Check into your room. The rest of the day is yours to prep cameras, rest or explore the island. Day 2 - 4 - (4 days) We head out to find the dolphins, once we find them we will jump in and swim with them. Depending on our success with the dolphins, we can (group vote), spend one of the days snorkeling with reef sharks and sting rays. Day 6 - Departure Day. You return to the airport for your journey home. Please note; this is a snorkel only expedition. * There are direct flights to Bimini from Ft. Lauderdale, Florida. You can fly via Silver airways. (prices average $200 r/t). * There is also a ferry available from Miami to Bimini as well. FRS Caribbean runs daily. Please Note; if the seas are too rough, they will cancel the ferry crossings (Prices average $150 r/t). 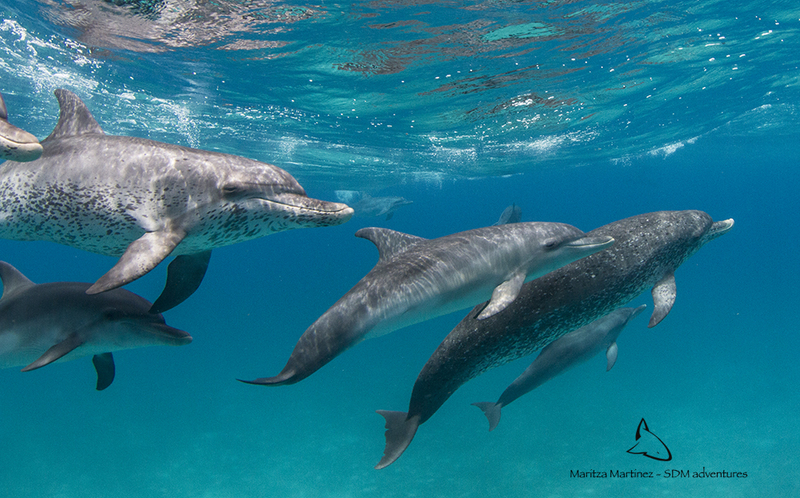 Join us for opportunities to capture videos and images of wild friendly Atlantic spotted dolphins. Interested in a little more than dolphins? You can join your host, Eli Martinez for some birding and reptile photography off Bimini Island. Depending on when we set off to find the spotted dolphins during the day (every season is different). We will head out in the early morning, or late afternoon to seek out birds and reptile species endemic to Bimini island. Bimini is a great spot for gray kingbirds, smooth-billed anis, Bahamas Yellow throat, or the Bahamas mockingbird. It is also possible to find white crowned pigeons on Pigeon cay as well as the elusive Bimini boa. 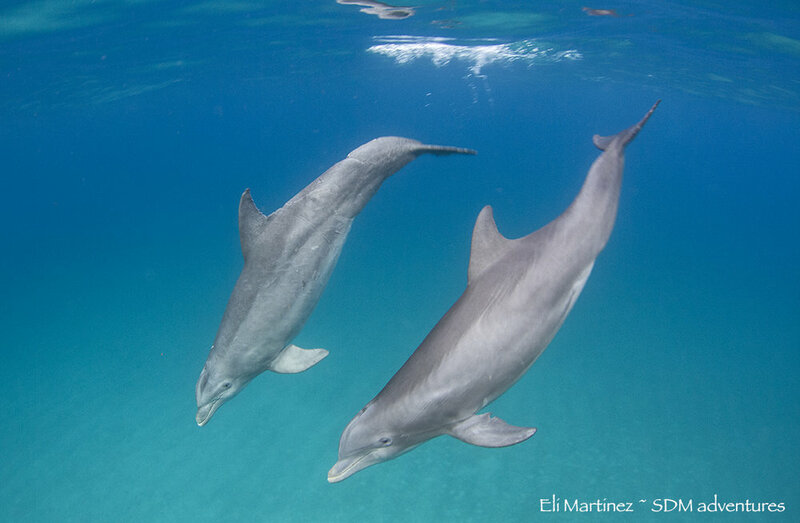 Thank you for your interest in our Dolphin Expedition. We will send you more information on this trip. If you have any immediate questions, regarding the expedition, please feel free to call us, or send us an email.